Remember how I said in the last post I wasn't feeling the sleeves? Well, with all the problems I had with these kimono sleeves, I would have been better of just setting in some regular sleeves. Yes, I had issues. Many. I started drafting this top on Tuesday, but scraped everything, including all the pics I too of the process. It just didn't look good. I tried drawing the full kimono sleeves and then shortening them. Did not work. I tried doing the French sleeve and then lengthening. Nope. I even looked at some kimono tops in the Mrs Style magazines I have. If you've never seen one - these magazines basically include very detailed drawings of how to modify your slopers to get to a particular design. I tried doing one, but since my design was different, it did not work. Or maybe my problem was overthinking it. I tend to do that. But, anyway, I tossed everything away and started from scratch. And here is what I came up with. First, a (very) rough sketch of what I want my top to look like. Excuse my poor illustration skills - I can draw a neck opening or any kind of other curve freehand, but when it comes to drawing a sketch like this - it comes out not so god. Oh, and it seems that pencil does not scan well. Ah, you live and learn. So... deep V neck, yoke, high waist cut and some flare below. And some gathers at the shoulder, under the yoke. Step 1: Move shoulder dart. In this case it is actually easier to start with the back. It will be easier to draw the sleeve. You will get a better idea when I move to the front. In the back, we need to move the shoulder dart into the arm opening. Why? I don't want it at the shoulder, or the waist - the flare will come under the high waist seam. And the kimono sleeves like this need to be wider anyway or they will bunch up too much under arm. So take your back sloper, mark points 1 and 2 and draw a horizontal line from dart tip to arm opening. Mark point 3. and trace counterclockwise around sloper from 1 all the way around to point 3. Then, with a pin in the top if the dart, rotate sloper counterclockwise until point 2 on sloper matches 1 on paper. Mark point new position for 3. Trace around from point 1 to point 3. Step 2: Extend shoulder seam. Because we closed the shoulder dart, the shoulder seam is not straight anymore. Draw in a new shoulder seam and extend it out 14.5 cm. This is how much you want your sleeve to extend from the shoulder. This is largely arbitrary, but you cannot make it too small, not for this kind of a sleeve anyway, because you might have a problem when matching the front part. So. let's go with 14.5. Step 3: Modify side seam. This top does not have closures, so it will have to be pulled over head. I still don;t want it to be too wide, so I will take in the same way I did in week 4 and 5 because I liked how those two draped on the sides. This might not work here, or might have to be changed, but it is a strating point. So, take 0.5 cm of the side seam, then measure 10.5 cm down he seam and make a notch 1 cm long. Connect as in picture for the new side seam (in red). Also make a horizontal line at the notch - this is where the seam for the high waist will be. But don't cut yet! That's for later. Step 4: Finish the sleeve. At the 14.5 mark on the shoulder line, draw a line perpendicular to the shoulder line and extend below the start of the side seam. Then measure 4 cm down the shoulder seam. We are deepening the sleeve opening some more. Draw a line perpendicular to original side seam toward the line you drew from the shoulder. And you have the sleeve. Finish by connecting the shoulder seam and the tip of the arm opening by a curve to finish side seam. Measure distance "a" which you might need when drafting the front sleeve. Also measure distance "b" - the amount opened at the arm when the dart was moved - you will need this too for the front. In my case this was 2 cm. Cut the pattern out. Step 5: Move dart to waist. So we are moving on to the front. Start by marking points 1 ad 2 - the dart legs. Then find point 3 which lies "b" distance from 1, or the top leg of the dart. Why? Well, since we opened the back arm by "b" we need to match this at the front too. The rest of the dart will be moved to the waist. Why the waist when I have gathers at the shoulder you might ask. Because I decided to do a yoke. So I want to cut the yoke first and then move the dart back to the shoulder. And it will be easier to draw the sleeve. The shoulder dart would be distracting. Also, mark point 4 at waistline, straight down from the tip of the dart. Trace clockwise, from point 1 to point 4. Then, with the pin in the tip of the dart, rotate the sloper clockwise until point two on sloper matched point 3 on paper. Trace around the sloper from 3 down and around to point 4. This is what you should have at this point. Now on to the sleeve. Step 6: Modify side seam. Same as for the back. Step 7: Draw in the side seam curve. For the front we will start with the bottom of the sleeve, not the top. So, take your back and overlay over your drawing of the front so far. match the side seams from waistline to the notch (see pic) and then trace the curve. This is one place I got hung up before. Side seams have to match. Sometimes the curves are not the same (just think of princess seams) but the length has to be the same. Or you will not be able to sew them up. In this case it is a simple back to front matching so I believe it is safe to go with the same curve. Step 8: Front shoulder seam. OK, this is where I had the most problems. If you simply extend the front shoulder line by 14.5 cm (has to match the back, right?) this is what you get: the arm opening is much smaller on the front than on the back. See the difference? Now, the openings are rarely the same, but this seemed wrong to me. Also, if you intended to draw arm opening on the right - it would have to be curved a lot! But then I thought of something. Remember how we had to redraw the shoulder line on the back. Well, by doing that we effectively raised the shoulder line a little bit - we changed the slope of it. See the pic below. The ruler shows you where the shoulder seem would have been if we did not change it. See the arrow - that's 2 cm more! So, it would be only right to match this on the front. 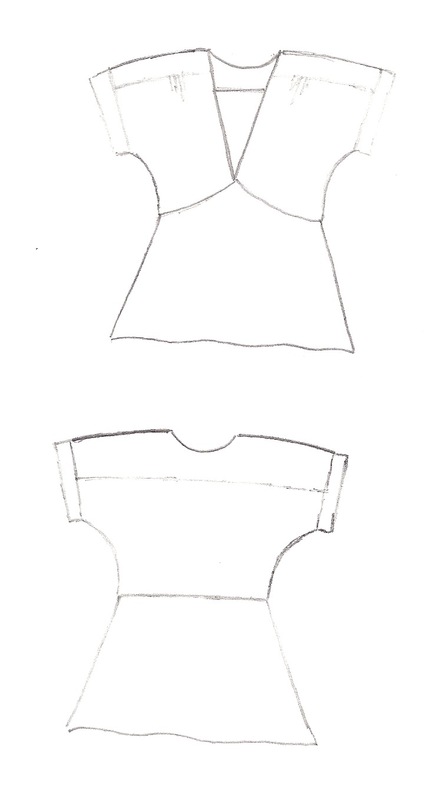 So redraw the shoulder seam by raising it 2 cm (at the and of the original shoulder line) and then connect that point to the neck, extend by 14.5 cm and draw the arm opening. It looks much better now, doesn't it? Step 9: Draw new neckline. I opted for a deep V. Measure 20 cm down the center line, make a notch. Draw a line (dashed) from the neck down to notch. Then measure that line, and make another notch, 1cm wide, 1/3 of the length down from the neck. 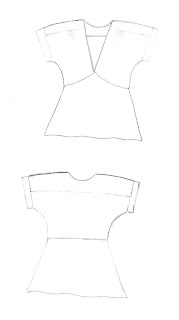 Draw a new smooth neckline from the neck, to the notch, all the way down to the middle line. This way you get a nicer looking V, then just the straight line. But they looked good. A bit too long, especially if I will be adding a strip on the edge, but no obvious problems or weird draping. The neck will need some tightening. And the back looks good, I just forgot to take a pic. So what next? Back to the drawing table. Tighten the neck, shorten sleeves, make the yoke and the bottom, flared part of the pattern. Muslin again. Good effort there. I'm pleased you got the sleeves to work.